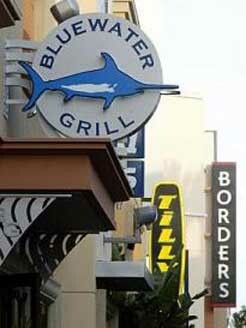 "The District" in Tustin, and one in Redondo Beach on King Harbor. the Marine Corp. Air Station, where we recently had dinner. Santa Ana for several years, and closed in 2007.
a trip to the beach, a stroll along the boardwalk, or a day out shopping. oyster bar, patio dining, and much more! 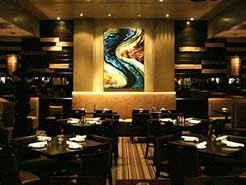 outfitting both restaurants with new furniture, china and interior appointments. seafood events, wine and oyster tastings at all three restaurants. possible future Southern California locations. original to make it an authentic Bluewater Grill. of sophistication that may just leave you swooning. Our appetizers arrive all at once, an artful collection of culinary presentation and they were simply fantastic without any exception. best way to enjoy Scallops, simply divine! sauce. It was truly delicious and very tasty. and the special Seafood Soup were truly outstanding. garlic butter was another divine way to enjoy Scallops! The wine list is an extensive multi-page assortment of predominantly California wines, with a smattering of Australian and European vineyards to round out the collection. a wonderful and new way to enjoy the amazing lobster meat. sauteed spinach and the five grain rice mix served cool. diverse possibilities of sweet tooth satisfaction. delivers 32-degree beer directly at the tap handle. to their shellfish growers in Washington’s Puget Sound. shellfish including Australian Lobster Tail and Alaskan King Crab. “Rib” Chop cater to the non-seafood lover. Pepper vodka, and Salt and Pepper Shrimp. including California and French varietals by the bottle and glass. call it more “current” than the Newport and Redondo locations. preview events for existing customers, the media and local VIPs. The restaurant is now open daily for lunch and dinner. Operating hours are 11 a.m. to 10 p.m. Monday through Thursday and 11 a.m. to 11 p.m. Friday, Saturday and Sunday. The address is 2409 Park Avenue at The District at Tustin Legacy. Complimentary valet and self parking are available. The phone number is (714) 258-3474. Reservations are encouraged.